When designing the interior of a home it is easy to understand that each room should flow from one to another. This concept is no different when it comes to flow from the outside to the inside of your home. Though the concept is the same, the feasibility can be more challenging due to the permanence of the architectural structure of the home. Because exterior changes tend to be a bigger commitment and are less flexible, a general rule is to follow more classic and timeless styles for the exterior of your home. A helpful strategy is painting window shutters and accent colors on the exterior to match the trim colors within the house. 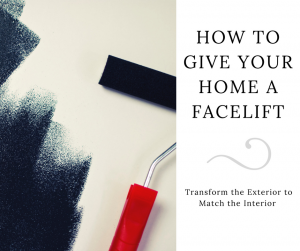 Just as painting the same trim color throughout the interior of the house can visually unite adjoining rooms, the same concept can be taken outside. This will help to create subtle flow from as you come into your home. Another strategy is to keep the same “intensity” or hue of color throughout the interior and exterior. This can also be thought of as brightness or purity of the color and it will help to create visual uniformity.